More and more, Open Source presents not only a cost alternative, but instead an innovation alternative, to proprietary enterprise software products. 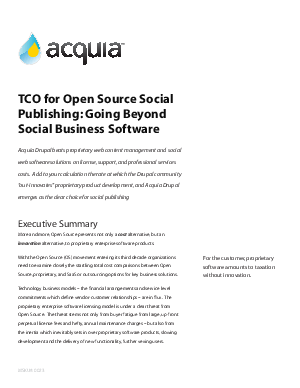 This paper compares the total cost of ownership of the Open Source Social Publishing Drupal solution to various proprietary Content Management systems, Social Business Software alternatives, and other community building software platforms. Our analysis shows that combined license and support charges come in at 2% to 11% of the costs of proprietary alternatives. If you are about to make a decision on a Social Publishing or social business software platform, read this paper first. Get the facts and compare the alternatives.